Detailing and one-of-a-kind design elements come together to form Cartier's Panthere bracelet. 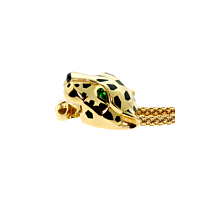 Black spots adorn the animal's head while Tsavorite eyes create a menacing glow. 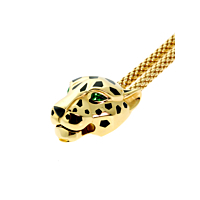 Made from 18-karat yellow gold and featuring onyx, tsavorite garnets and round brilliant cut diamonds Cartier's Panthere bracelet is an eye catcher! With it on your wrist, you'll display the side of your personality that's courageous and chic.